The Academy is the professional development arm of Road Safety GB. It was formed in 2013 as a result of the merger between Road Safety GB and IRSO (Institute of Road Safety Officers). The Academy aspires to provide all practitioners engaged in road safety with support and guidance to develop and enhance the right tools and skills to deliver effective, evidence-led road safety interventions. 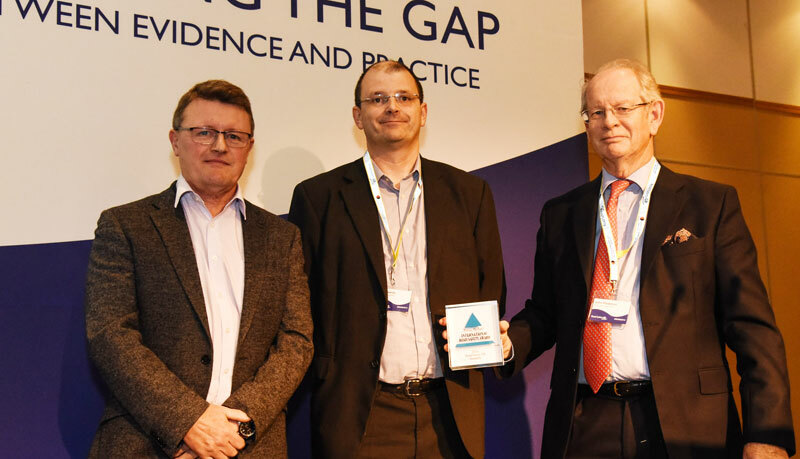 In 2016, The Academy was awarded a Prince Michael International Road Safety Award (pic below) for its achievements in improving the quality of training on offer for road safety professionals, and standardising the delivery of road safety initiatives. For all enquiries about the Road Safety GB Academy in the first instance please contact Sally Bartrum, Academy administrator, by email or on 01379 651828. Our aim is to develop, deliver and facilitate opportunities for academic and vocational continued professional development (CPD) for all practitioners engaged in road safety. Our vision is that all CPD meets a recognised minimum standard and that all training opportunities are accredited to this standard. This will help ensure that road safety activity across the UK, and further afield, is evidence-led, focussed on achieving positive results, robustly evaluated and recognised as good practice. We recognise that we cannot achieve our aims without proactive multi-sector involvement to develop, implement and monitor minimum standards for professional training. Through membership of the Academy you can play a vital role in shaping and influencing the emerging national standards. As well as providing a great opportunity to network with like-minded practitioners, The Academy also provides a mentoring system to provide support for members. • Local authority officers engaged in road safety activity whose local authority employer is a member of Road Safety GB – subject to that individual meeting the membership criteria, and subject to a maximum of 10 free Academy memberships per member. Any further applications are welcome but will be charged at £35 plus VAT per additional member. • Road safety practitioners delivering services on behalf of a local authority through an outsourcing contract – again subject to the individual meeting the membership criteria. We are also pleased to invite applications for membership from individuals working in the private and voluntary sectors, subject to them meeting the membership criteria . The current rate for annual membership is £35 plus VAT. All members of the Academy will be awarded the post-nominal AMRSGB (Academy Member of Road Safety GB). Please note that membership is not available to public sector practitioners whose local authority employer is NOT a member of Road Safety GB. In addition, publications and documents that are made available to Road Safety GB members as part of their membership package are not available to individual Academy members.